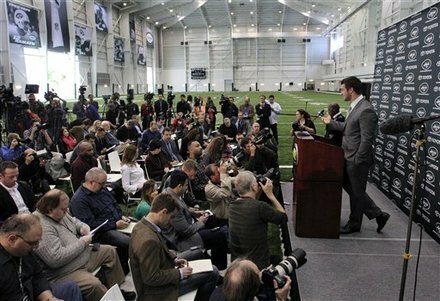 So, Tim Tebow's first press conference as a member of the New York Jets was earlier today and it was a big deal. My father was covering the event in Florham Park and when he's covering an event, it's news. And you could tell that Tebow was very excited to be a member of Gang Green. Very excited. The fine folks at Buzzfeed put together a video of every time Tebow said exciting or excited. Let's go to the videotape.